It is the responsibility of each building's secretarial staff & central office secretarial staff to maintain and keep up to date the information that is synced to SchoolMessenger for school delay and closing notifications. This information is pulled from the Staff District Registration screen in eSchool nightly to update SchoolMessenger. Staff member must have one active & primary building. Staff Email must be entered and correct on Staff District. Click on the NAME of the employee to get to the Staff District screen. Email Address from this field (red box) will be sent to SchoolMessenger. This must be the assigned Sparksd.org email address and may NOT be changed. 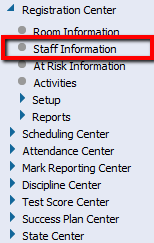 Navigate to the District-Defined tab to change telephone number, staff group and Do Not Call information. Telephone number must be ten digits with no spaces, dashes or parentheses. Staff Groups should have self-explanatory titles.